On the August long weekend last year, seven intrepid guests and two guide’s from Powell River Sea Kayak took the opportunity that the fantastic weather presented us and paddled beyond Desolation Sound. Over the course of a week we paddled in awe of immense mountains, beneath plunging waterfalls, and in the presence of majestic humpbacks. Our campsites were remote and beautiful, far off the beaten trail and laid out under a sheet of stars. If you are interested in how an expedition-style tour with Powell River Sea Kayak plays out: from how much paddling occurs to the places you may visit to the things you can see, please read on! The morning was grey, but the clouds were beginning to part as we launched from our home base in calm and protected Okeover Inlet on the first morning of our adventure. The long-term weather report leading up to the trip was decidedly winter-like for the BC coast … but about 36 hours before guests arrived there was a sudden change, and the rain and wind forecast was instantly replaced with sun and warmth. In reality the seven days that we paddled into the mountains and back again saw probably the most perfect weather of the entire summer! 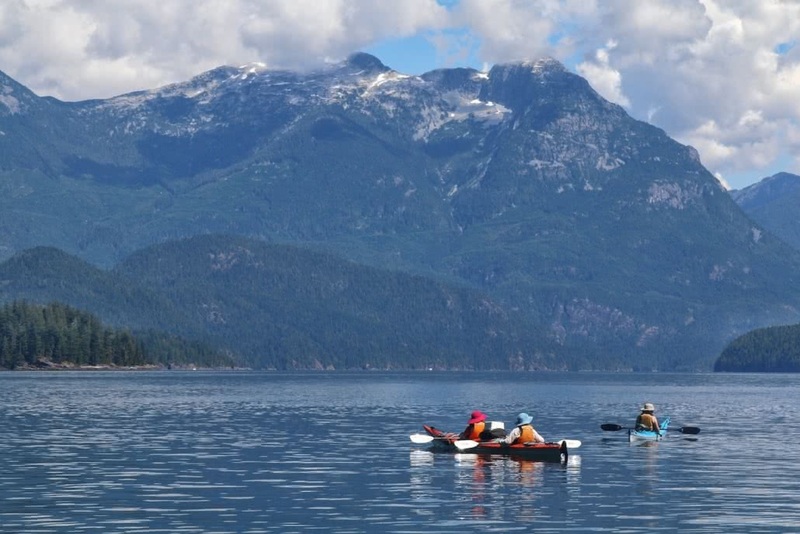 Our group consisted of 3 siblings and 2 spouses from Toronto, Ontario, as well as 2 friends from the west coast of BC that had completed one previous kayaking tour on Vancouver Island many years prior. Kyle and I – guides for this exciting expedition-style trip into the waterways of Pryce Channel and Toba Inlet north of Desolation Sound, rounded out the party. 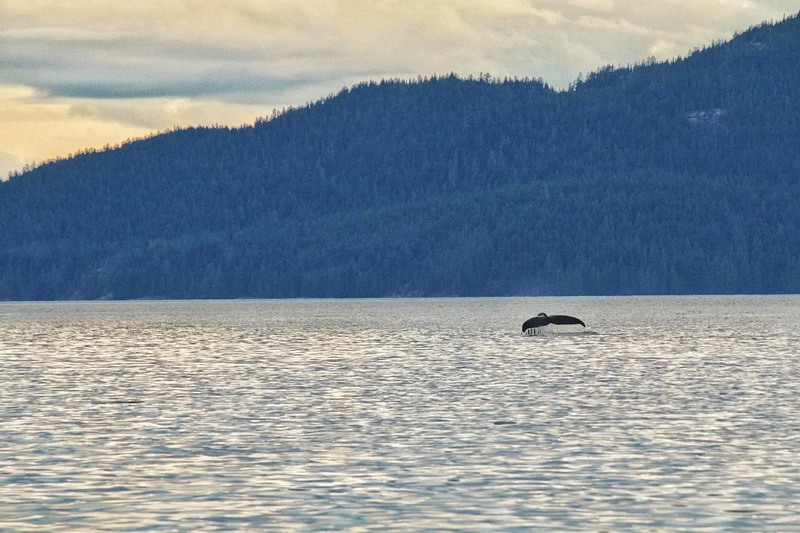 We launched in the late afternoon and paddled with a slight tail wind north towards the mouth of Malaspina Inlet and the entrance to Desolation Sound. Passing our usual lunch spot in good time, we continued on and entered the Sound on the western side of the inlet and stopped for lunch after 2.5 hours of paddling at Feather Cove at the tip of Malaspina Peninsula. After lunch we made two crossings, first to Kinghorn Island (the site of Cabana Desolation Eco Resort and beyond that a campsite that we often stay on the first evening of a tour), and then once more crossed to the Martin Islands in the northern part of Desolation Sound, a total of 9.5 nautical miles. Desolation Sound is a key part of this tour – and we spent two nights here, the first and the last – but we were all looking north at what was to come in the coming days. After a wild salmon and risotto dinner everyone was slightly sore but very content as they went to bed just after the sun set over Cortes Island. We woke to the clear skies that came to dominate the rest of our adventure. A breakfast of scrambled eggs, sourdough toast and vegetable hash fuelled us up for the day ahead – the longest planned for the whole trip, from the Martin Islands north through Lewis Channel, beyond Teakerne Arm and Redonda Bay to a private tenured campsite just south of Connis Point at the tip of West Redonda Island. The wind was light but variable as we paddled past Refuge Cove and attempted to settle into a rhythm for the day. Perhaps the muscles were a little stiff – and maybe the current was not in our favour – but the first leg of the day required everyone to dig a little deeper than yesterday as we approached the mouth of Teakerne Arm. Kyle and I traded places throughout the morning to check in on everyone and see how they were feeling. We continued to hone in on our guest’s strokes, striving to help them achieve greater efficiency that would come in incredibly helpful over the rest of the tour. After a brief discussion, we decided to stop for lunch a little earlier than originally intended to give everyone a nice break and rest before the afternoon push to camp. After a quick switch of kayaks to give those of us feeling a little weary a chance to paddle together in a double, we launched again and headed north beyond Teakerne Arm. Conditions now were perfect – a slight tail wind and an ebb current that pulled us northwards. Any time lost in the morning was quickly regained, yet as this was the day of our longest paddle, we still had a ways to go! As we reached Redonda Bay and the north-west tip of West Redonda Island, the mountains we had been searching for started to impose themselves on the scenery, and we stopped for a quick break one last time before our last push to camp directly opposite the impressive mass of Raza Island and the beginnings of the Coast Mountains to our north. Not too many people camp this far north of Desolation Sound, and Kyle and I immediately set about creating a makeshift kitchen from whatever scanty pieces of driftwood we could find while our guests set themselves up with their tents and poured themselves a well-earned glass of wine. Dinner tonight was Thai chicken and tofu lettuce wraps with hot coconut fried bananas for dessert – not bad fare for the remote environment! And to top it off, just as we sat on the cliff at the edge of camp to enjoy our meal, a humpback whale surfaced directly in front of our vantage point – less than 100 feet from our camp – and took 3 or 4 breaths in succession before diving deep into the channel on its way south. The perfect end to a long but incredibly rewarding day! The sun was peering over the rugged spine of West Redonda Island early on Day 3, illuminating the forest on Raza Island to the west and bathing the mountains to the north in brilliant light. We were all up early, devouring another delicious breakfast – butternut squash & leek pancakes today – before we hit the water as a group just as the sunlight reached over the towering trees behind our campsite and landed on our departing kayaks. The water north of the Redonda Islands takes on a greenish hue, which shifts into tones of turquoise and blue as you turn to the east and paddle closer to the mouth of Toba Inlet. This is due to the glacial runoff that enters the sea from two rivers right at the head of Toba, and it conjures a feeling of more tropical environments than the temperate rainforests of the Pacific North West. In fact, the entire terrain north of West Redonda Island feels more like the Hawaiian Islands or the coast of Thailand than anywhere else on the west coast. The lush green rainforest on both sides of Pryce Channel, where we were now paddling, drop precipitously straight into the greens and blues of the ocean, and water cascades down narrow ravines carved into the rugged island and mainland landscapes from lakes far above. Ahead of us, to the east, we could see the first of the snow capped peaks that frame magnificent Toba Inlet, our destination for the day. With every stroke we approached closer, and once again a slight wind appeared at our back – this one caused by the inflow of cooler, ocean air rushing in to replace the warmer air above the sun-drenched mountains – which pushed us ever nearer still. We crossed Pryce Channel after half an hour or so and were now paddling along the mainland coast. Perhaps one or two sailboats were spotted all morning, far in the distance, and it felt as though we were alone in this remote and awe-inspiring environment. We rounded a point in the mainland and came upon a simply perfect beach of crushed rock and sand right at the mouth of Toba Inlet for lunch. From here the great, steep fjord twisted and turned its path right into the icy peaks of the Coast Mountains, which we could appreciate from our comfortable position in the sunshine thousands of feet below. Our guests all went swimming in the blue ocean to cool down as Kyle and I prepared the lunch. Two and a half days of kayaking had turned everyone into efficient paddling machines, and while we were grateful for our idyllic lunch spot, everyone was just as eager to get back on the water and travel deeper into the mountains. 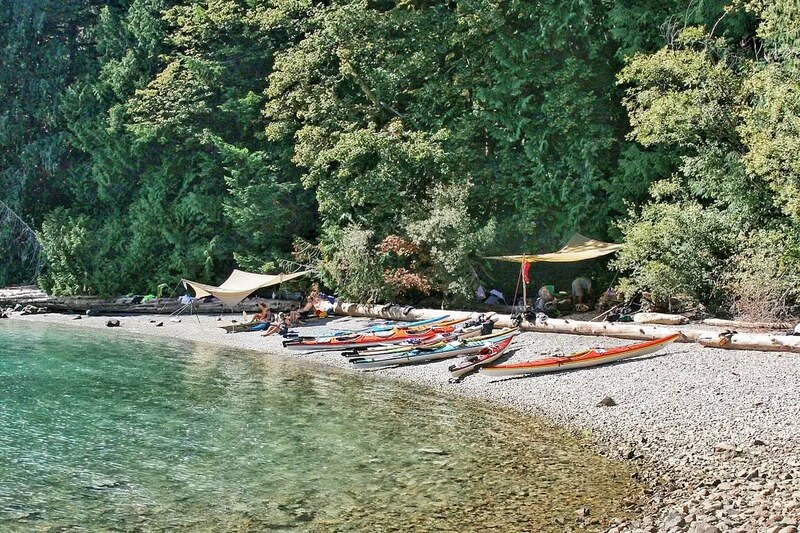 Our campsite in Toba Inlet is another private tenure that we maintain for the exclusive use of our tour groups, and the perfect place to base ourselves for further exploration of this remote and impressive destination deep amongst the BC Coast Mountain range. Our plan was to do just this – spend two nights at our comfortable base and paddle deeper into the inlet on Day 4, before resume our loop of the Redonda Islands and returning to Desolation Sound in the days to follow. Our camp was another perfect beach of crushed rock and sand that received most of the day’s sun, with multiple tent spots hidden just beyond the trees in the cool shade of the forest behind us. Kyle and I set up our kitchen away from the tents – this is bear country after all – and set about creating another rich and fulfilling meal of Pasta with Pesto, Artichokes, Sun-dried Tomatoes and Black Olives, before the sun set over the mountains that now lay to our west and we all climbed into our tents in anticipation of exploring Toba Inlet in the morning.